Far away from bike paths that lead to grocery stores that sell kale is Appalachia. It runs through West Virginia and eastern Kentucky, and some parts of Tennessee and the Carolinas, too. It’s mostly dirt-poor and the things for which it’s known—family feuds, coal mining, moonshine—seem to have little connection with modern life in other parts of America. These days, unless Appalachia is being mocked, it’s generally ignored. Which is why it’s strange that this memoir has struck such a chord. It has been sitting atop the bestseller lists for months and has received coverage in tons of major media outlets. On its face, the story doesn’t seem to be widely relatable. J.D. Vance’s family originated in the hills and hollers of rural eastern Kentucky. He experienced the traumas that often shadow poor communities: drug abuse, outbursts of violence, and other self-defeating behaviors. But, unlike many, Vance escaped and prospered, eventually attending Yale and joining a San Francisco investment firm. Hillbilly Elegy reads like a gateway into the world of “Bloody Breathitt” County, Kentucky. But it also details the process through which Vance found a better life outside the region. The book is interesting as a depiction of an overlooked place, but it also works as a coming-of-age story. And it’s getting talked up as a kind of Rosetta Stone that explains election results. The Times calls it “a civilized reference guide for an uncivilized election”. I’m not sure that I totally buy that. Appalachia is a pretty unique place. I don’t know how much you can port over its attributes to cities in the Rust Belt and so on. It’s worthwhile to examine a culture and community for its own sake, but if you’re just looking for national power brokers or explanations for electoral trends, Hazard, Kentucky might not be where you want to start. Even if Hillbilly Elegy can’t provide pat answers to complex political questions, it’s still a good book that’s very affecting and ultimately inspiring. If you would like to learn more about the region, I’d recommend this book, as well as two documentaries. American Hollow focuses on the same area and lifestyle described in Hillbilly Elegy and Oxyana viciously captures the prevalence of drug addiction in Appalachian communities. It’s great that attention is being drawn to a part of our country that’s often been forgotten—hopefully, it will lead to some real change for the region. Vance, J. D. (2016). 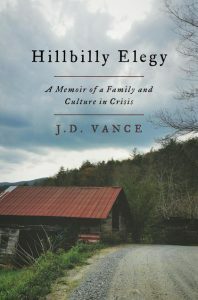 Hillbilly elegy: a memoir of a family and culture in crisis. New York: Harper.